We'll create a column to show the month corresponding to any particular date. Note that this is actually a bad idea, as it would be much better to do this using a calendar, but a) we haven't covered them in this blog yet and b) this would ruin a nice simple example! Click on the tool shown here. 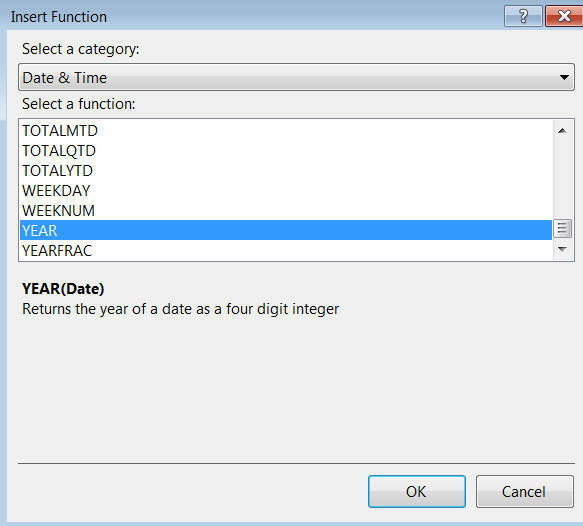 Choose this category to find a function giving the year for any given date. Often it isn't as obvious as this! I've renamed the column too. For the final part of this blog, I'll show how you can make choices using the IF or the SWITCH functions.